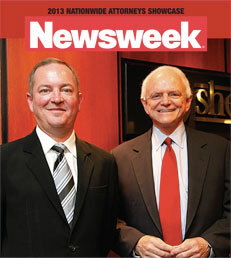 Recognized by Newsweek magazine as one of the top litigation law firms in the United States, Sheffer Law Firm, PLLC continues the tradition of excellence established by its founder, Ron Sheffer. Since its inception in 1982, Sheffer Law Firm has handled complex litigation throughout the Commonwealth of Kentucky. In the last ten years, the firm established a national presence in products liability litigation and John Sheffer was recognized by Newsweek magazine as one of the top fourteen product liability attorneys in the country. The lawyers at Sheffer Law Firm assist clients in a wide variety of litigation matters. Medical malpractice has long been an area of the law where Sheffer Law Firm has excelled throughout Kentucky. Also, in addition to its vast products liability practice, Sheffer Law Firm continues to represent clients in toxic tort and premises liability cases. Currently, Sheffer Law Firm is one of the leading defense firms in Kentucky in handling a variety of cases related to nursing home care and administration. Commercial litigation continues to be a mainstay of the firm's practice and several of the firm's clients are consistently included in Fortune's Top 100 and 200 lists. Sheffer Law Firm, PLLC continues to represent clients with personal injuries. Most notably, the firm's successful representation of several widows of coal miners who died in an Eastern Kentucky mine disaster, was featured on the acclaimed CBS news program, 60 Minutes. Insurance coverage, general contract disputes, construction litigation and construction law round out the majority of the firm's interesting and varied practice areas. Our attorneys have developed strategic alliances with highly regarded experts throughout the United States at some of the nation's top universities and medical facilities. Similarly, the firm has longstanding relationships with some of the country's top scientists and researchers. These relationships are critical to assessing your case and providing the support necessary for presentation at trial or mediation. Sheffer Law Firm has the resources necessary to solidly prepare your case. Our attorneys are skilled in their respective areas of practice. Using the latest advanced technology, Sheffer Law Firm has access to the most current law and legal research tools. We have the resources required to protect and defend our clients. We are skilled litigators and negotiators and we are good at what we do. Period.